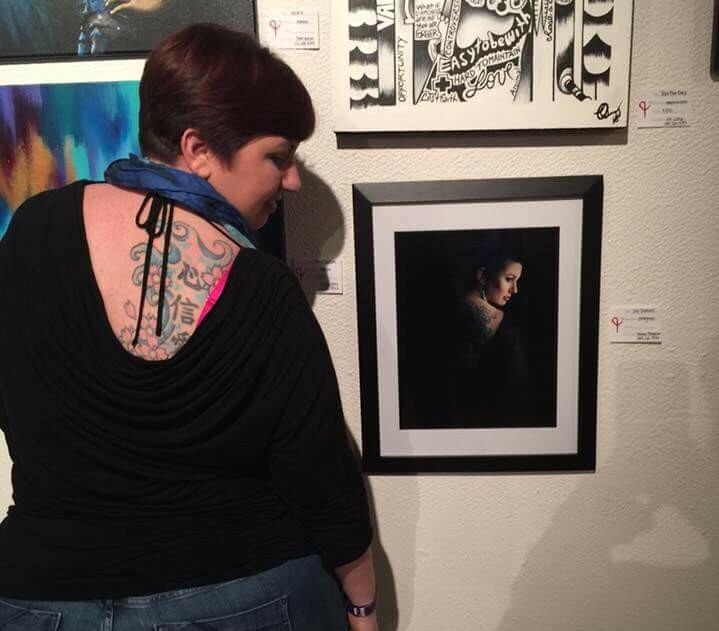 I wanted to share with you, that I was recently invited to show a piece in the ArtLoveMagic gallery in Dallas. I was so honored to be a part of the show. Iris Candelaria has been so amazing! She asked me to choose a piece that showed both a woman’s fragility and fierceness. My first thought was to use one of Susan’s Surviving Beautifully portraits. Susan was one of the first Surviving Beautifully models. She had colon cancer, and when I met her, she had just finished chemo. She arrived wearing a wig. I took some ‘before’ pictures, as I usually try to do (when I remember!) and I did her hair makeup myself. As I was doing her makeup, we were chatting and I asked her what kind of style she really likes. She told me that she’s a big fan of the pin-up look. So I went a little more dramatic with her makeup, and I had a black Marilyn Monroe style dress in the studio that fit her perfectly. I added some jewelry and a hair flower that I had made, and we were in business for her first look. The first two outfits were with wigs, and at some point, she decided that she would be okay with shooting with a headscarf. While shooting, we were having so much fun that she decided to take the headscarf off. To me, this has become the most iconic series of images to the Surviving Beautifully project. It represents everything I want this project to be. When I was helping her dress, I noticed her back tattoo. I could immediately see in my mind a beautiful shot of her back, without the wig on. I am so grateful that she trusted me enough to get this portrait. I had her sit on a stool on a black backdrop, draped her in black fabric, and used only natural light. That, to me, was one of the most fierce and vulnerable moments of my photography career so far. She placed so much trust in me and my vision at that moment. Two weeks later I sent her her finished digital files. I invited her to purchase prints from me, only if she wanted to, and the print sale would go back into Surviving Beautifully. This is never a mandatory thing. All SB models are free to do almost anything they wish to with their portraits for their personal use. She decided she wanted to come back and purchase prints with her mother a couple of days later. When she arrived, I was a little floored. She wasn’t wearing her wig, and she had makeup on! She told me that after she saw her portraits, she stopped wearing the wigs and she went and bought herself some new makeup. She felt beautiful in the photos and now had the confidence to rock it without the wigs. I cried after they left. I am not the type to cry a lot, but I did. It touched me so deeply, that she came without a wig on and that my portraits had such an influence. I knew at that moment, that I had to continue this project. Fast forward about 9 months, and I decided to show her portrait in the ArtLoveMagic gallery. As I was messaging her that I would be using her portrait, it occured to me that I didn’t know what her tattoo actually meant, so I asked. She said, “It’s heart, faith, love and happiness. Heart in what you do, faith in yourself and you will find love and happiness.” How perfect is that?! 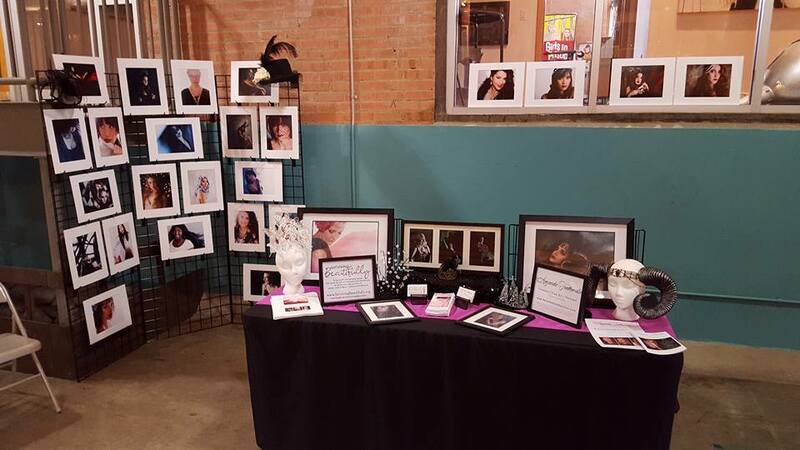 This was my very first art show, hopefully the first of many and I was honored to have Susan’s as my first display. People walking by it may not know the backstory, but I do, and it’ll be special to me until the day I die. You know how much I love what and where you are today yourself. I can see in your work, the love for what you are doing and am so proud of who you have become. Love you. Everytime I see or read this “memory” it makes me cry. 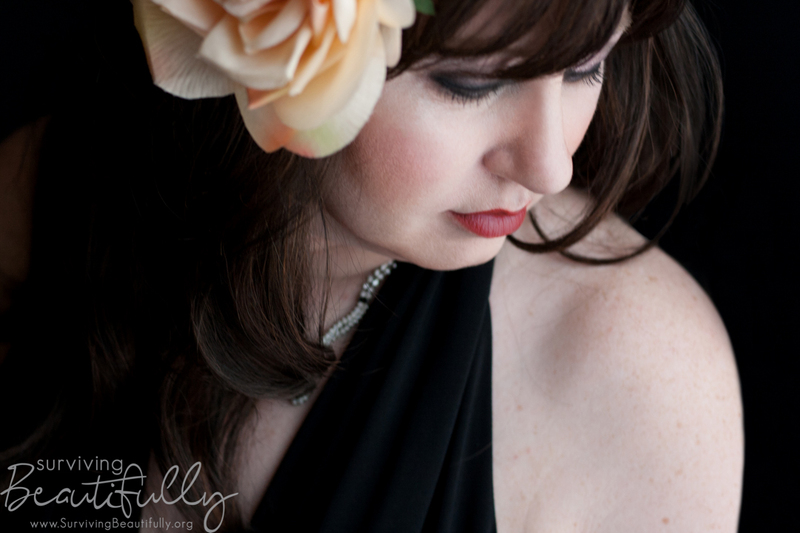 You and the Surviving Beautifully photo shoot really did have a huge impact on my self image and confidence. After chemo I felt like just a shell of my former self. I couldn’t see me, the me I used to see before the surgeries and hair loss. I felt hollow. You showed me that I was still in there and I had nothing to hide from. My sincerest thank you Amanda.